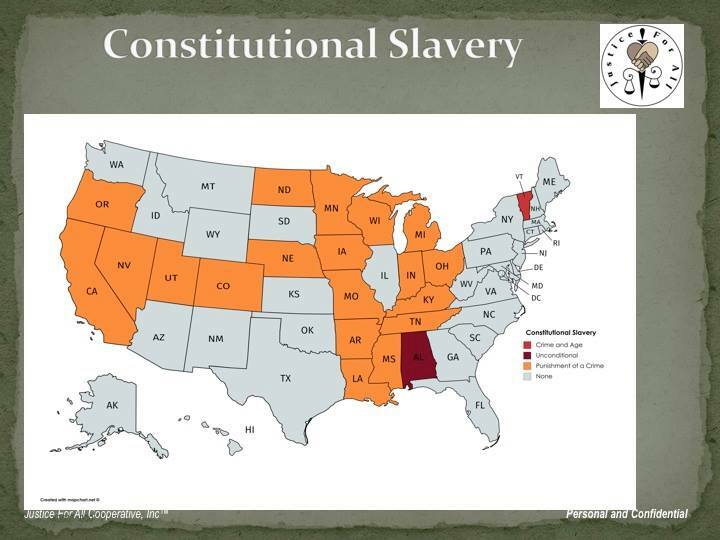 Slavery has never been constitutionally abolished anywhere in this country. This year, the Racial Justice Reform Coalition asked the senate to “urge the 2019 senate” by resolution to amend the constitution, removing slavery. Despite adopting S.R.11, which urged the 2019 senate to introduce an ERA amendment, they refused to introduce a resolution urging the removal of slavery from the constitution this year. Afterwards the house introduced a resolution (H.R.25) urging the 2019 senate to take up such slavery amendment. House Operations never took it up. Stop. Think. Why do you think folks don’t know this? Although we have every indication that this will likely be one of the first priorities of the senate next year, it is short sited to suggest that this is “one of the last vestiges of slavery” in our laws. The constitution, originally written on 1777 and amended 28 times is largely the same document and it was not written for black and brown people (it had them in mind). Dismantling systemic racism takes more than changing the constitution. Unraveling all of the language that has and continues to create and sustain white supremacy is a full time job. But what about all of the rules, statutes, court decisions and institutions upheld by the constitution? To change the constitution without this discussion misses the institutionalized racial impact of the constitution and keeps us form a methodical dismantling of the affect. Why don’t our lawmakers have an open debate on this language in the constitution? Why wouldn’t the press want to cover it, at least to the level of healthcare? Among other things, a good constitutional debate on how we classify our inmates would do us well. Do we, as Vermonters really want to continue to consider our inmates as “slaves”? How do we treat them? How and where do we house them? What do we pay them? How do we profit from their labor (Vermont Corrections Industries)? 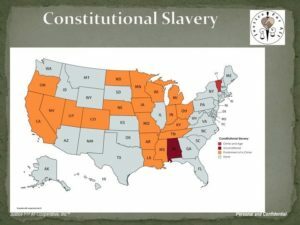 The constitutional slavery debate is one that must ask tough questions like “why do we continue to teach our children that we were the first state to abolish slavery?” And “what other falsehoods are we teaching them?” The debate about slavery is one that should question our culpability in transporting these “slaves to other states. And yes, how does the threat of prison slavery impact 1500 brown bodies that uphold a white man’s dairy industry on a daily basis? Indeed one of the oldest and nastiest debates in national history has been how white people have responded when morality, profit and labor collide. Perhaps if we were to have this debate we could have conversations about how well white folks have historically performed with that collision. This might give us the ability to candidly acknowledge the political and economic power that came (and continues come) from the exploitation of the labor of black and brown people. This would further enable discussions on the false narratives of black and brown inferiority created to sell the sham to others. We could also engage in open discourse on how those decisions continue to impact black and brown people and communities today. Who knows, a good debate might shed some light on existing practices that sustain white supremacy and maybe even head off a future train wreck or two. It might be pushing it but imagine this debate shining a light on those who refuse to call shenanigans as they benefit from the product of the exploitation of black and brown bodies, all while somehow expressing their hollow so called sorrow for those that they watch exploited. Our elected officials have been taking an oath to this constitution forever. Not knowing that the language was there is probably worse than knowing and doing nothing. So now we turn to the outpouring of concern surrounding the overt racism that forced Kiah’s resignation. As real as that is, there is little discussion on the systemic racism that impacts 31K black and brown Vermonters (on a daily basis) and without a doubt contributed to Kiah’s fate. Legislators should stop congratulating themselves on the Act 9 and Act 54 from this biennium and acknowledge the uphill battle that it took and the important components of this legislation that never saw the light of day. I try not to miss an opportunity to mention to white people that I have never met a white person that doesn’t have a racist in their family. Lately, I’ve added that I have never met a white person who hasn’t silently witnessed oppression of black and brown people. I say it. I wait. I suppose now I will just leave them with one last question after positioning the first two. “Why is this? Join us in a session on abolishing constitutionalized slavery in Vermont at the Unitarian Church in Montpelier tonight from 6:00 till 8:00 PM.